Some games are fierce battles, or proper displays of talent. This game was neither of those things, really, no offense to any of the players from either team. But the winning goal that stood was from the guy who was in the right place at the right time to capitalize on the embarrassing error of Cordaz, Crotone’s keeper. 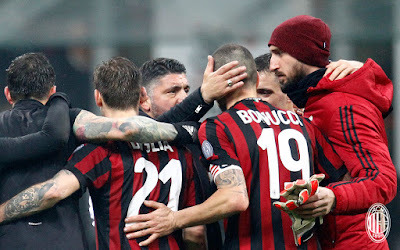 And thank goodness for Bonucci being there, too, because Milan recorded 26 shots, nine of which were supposedly on goal, and only one goal was actually scored in this match. First, I want to go back to the premise of my preview for this match: Which coach is the worst in Serie A? Well the goal was conceded by Crotone, as a goalkeeper error, by a team which is coached by a former goalkeeper. So Zenga clearly wins the worst coach hands down. One only had to look at his face when the goal was scored to know he knew this was bad on every level. Secondly, for the gamepost, I photoshopped La Befana helping us to fight I Squali (the Sharks), requesting her help with this Sharknado… er… ummm… match. The short version of La Befana’s story is that she is an old woman/witch who brings gifts or coal to the children on January 6th. Believe in her or not, but I do. For one, she brought my kids their gifts. Two, we did beat Crotone, against some very not-clinical shooting odds, so someone clearly intervened there (and I think I saw her broomstick in the distance while Bonucci was celebrating.) But three, Benevento won. Again. Two games in a row now after no wins for 17 matches. And Benevento are called the… wait for it… witches. So clearly, Befana was busy making everyone happy. But witches and Sharknadoes aside, Milan were taking this match very seriously, and things started to really heat up at the end of the first half. Biglia took a shot that was just wide, then Suso hit the post in a way that I still don’t understand how that ball didn’t go in. Then Biglia got a yellow in the 45th, and it was halftime. 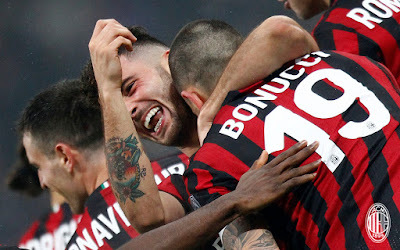 In the 54th, the most amusing goal of the season and his first goal in the red and black, was scored by our captain, Bonucci. As the goalkeeper, Cordaz, tried to punch away a shot, he punched it straight down to Bonucci’s head, which was already trying to score and thus did. 1-0 Milan. Crotone fans would probably call it tragic, but I found it absolutely hilarious. And Bonucci was not ashamed, he took that goal that Cordaz accidentally served right up for him, and he celebrated like no tomorrow. It was absolutely delicious. A few minutes after that, Romagnoli collided with Gigio’s giant body and was down for a while, hope he’s okay. No time to worry, though, because Kessie scored a screamer in the 59th, just five minutes after Bonucci’s goal… only to be called off due to VAR (I think it was offside?) So disappointing, Kessie was a beast as usual, and that goal was amazing. But it was still 1-0 Milan. And Kessie would be subbed off injured in the 83rd, too, the kid can’t catch a break. Hope it was nothing and he’s back after the break. The rest of the match was just shooting practice, subs, and a goal called back in the 94th because of a foul before the whistle. Some good performances, including one from Calhanoglu. Well, there was a Kalinic yellow in the 94th, too. 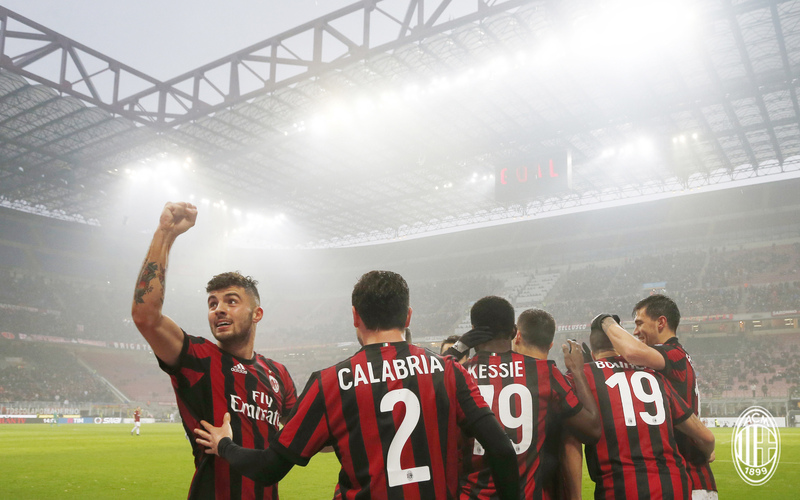 But after a match where Milan didn’t play so well but got a single goal and a single point for reacting against Fiorentina, It was great to take all three points away today for playing a lot more, even if we still ran out of gas. And we also learned that Gattuso is not, in fact, the worst coach in Serie A. See how much we can learn when someone is in the right place at the right time? Stay tuned for an all new Milan Obsession Podcast!